As 3G networks are rolled out around the world, mobile operators are all looking to offer subscribers reliable coverage at an affordable price. They request the same high-capacity data transfer to be provided in rural regions as it does in urban environments. In addition, through providing complete indoor coverage, the operator has good chances to further increase their revenue. Stockholm-based Avitec may just well have the solution to this challenge. Their recent launch of a very innovative generation of repeaters offers mobile operators unrivalled opportunities by simplifying deployment of a 3G network. In rural areas, EDGE is deployed as complementary coverage to WCDMA and in urban regions indoor coverage of GSM, EDGE or WCDMA is provided through a fiber optic distribution system. EDGE - Enhanced Data Rates for Global Evolution - is a 3G radio technology that triples the data com capacity of GPRS-enhanced GSM networks. This allows operators to easily introduce cost-efficient, high bit rate applications in one seamless network ensuring faster time to market. 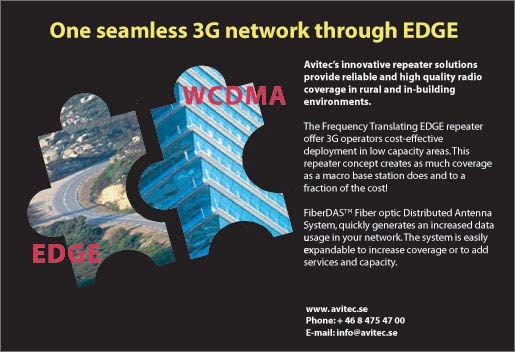 "EDGE allows operators to offer extended coverage in areas where other technologies, such as WCDMA, simply don’t make financial sense, such as in areas where the demand for capacity is limited," explains Håkan Samuelsson, CEO at Avitec. "Our Frequency Translating Repeaters are quite unlike conventional repeater solutions. They provide the same coverage as macro base stations do and to a fraction of the cost." The new EDGE repeaters cover larger areas made possible by the Frequency Translating Technology that allows for a very high output power, hence covering vast areas. Site acquisition is made easier since there is no need for line-of-sight between the base station and remote site due the repeaters high gain. Choice of site is thereby made very flexible and the masts can be quite short, further reducing the site costs and simplifying deployment considerably. The traditional advantages of using repeaters still remain, i.e. no need for a shelter or transmission and the power consumption is very low. The donor unit is installed next to the base station where the signal is coupled off via a directional coupler. Following frequency translation, the signals are transmitted on a link antenna and received at the remote site where signals are converted back to the original frequencies. Finally, the signals are amplified in the remote unit and then transmitted on a server antenna. The frequency translation technology allows the use of an omni directional antenna at the remote site. By shifting the frequency, the isolation requirements are reduced. In other words, the necessary separation between the pick-up and server antennas can be as low as three meters, which means very short masts can be used. As the isolation is much easier to achieve through operating on two different frequencies, the gain in the remote unit can be significantly increased so that superior output powers are obtained. In other words, large areas can be covered at a minimized cost. Many operators have licenses on both the 900 and the 1800 MHz band. The cell sizes are generally much larger on the 900 MHz frequencies compared to the 1800 MHz frequencies. Considering this, Avitec has taken the concept of frequency translation one step further. By transmitting the link on the 1800 band, while providing the actual coverage on the 900 band, the isolation requirement is zero. There is no need for any separation between the pick-up and server antennas. Actually, the pick-up and server antenna can be placed back to back! This will further reduce the site costs as the masts are even shorter. EDGE forms the foundation for one seamless GSM and WCDMA network that is transparent to the end user. Capacity is tripled compared to GPRS and allows for new applications at higher bit rates. Basically, EDGE introduces a new modulation technique and a new channel coding, resulting in an increased demand on the Error Vector Magnitude (EVM) in comparison to conventional GSM networks. This results in an isolation requirement of at least 25 dB, which converts to as much as forty meters for a conventional repeater in an EDGE environment with 80 dB gain. However, by shifting the frequency the isolation requirement, even in an EDGE environment, is only three meters. Output power is uniformly high, resulting in coverage comparable to that of base stations. With the entrance of packed switched traffic, today’s well established radio planning technique using frequency hopping will lose its importance. Therefore the use of channel selective repeaters will increase, thus enabling higher output power and higher data rates. Avitec’s Active Indoor Coverage Solution enabling multi-band usage gives operators a competitive edge. A flexible Fiber Distributed Antenna System enables efficient use of available frequency spectrum and allows for effortless frequency planning. Easy installation is achieved with optical connectors and automatic gain leveling. Furthermore, the Total Cost of Ownership of this solution is in line with conventional passive solutions. The FiberDAS has built-in compensation both the Tx and Rx paths for optical loss differences and component parameter variations. Therefore, Tx path gain for each link is known and need not be measured. Also, noise contributions from each Remote Rx path is equalized for best sensitivity. The installation process consists of a limited number of steps including mounting units, plugging in and turning on. By using single mode fiber, no more than 4 dB optical loss is achieved at a maximum 6 000 meters run length. An active antenna system has the advantage over a passive solution that it enables multi-band usage without having to consider path losses on the higher frequency ranges and on the in-line cable amplifiers. Thereby, the system is easily expandable to encompass additional operators or frequency bands or provide additional coverage. Deployment is just one part of a repeater’s lifecycle. Long-term gains come from an efficient management of network elements. Mr. Samuelsson explains: "We use a central management solution that provides operators with simple repeater set-up, configuration and commissioning as well as advanced remote control and supervision. This can also be augmented with dedicated reporting tools, which enable optimized planning of network service." The advanced supervision tools give the operator immediate and continuous information about the condition of the system. The status of all repeater elements can be viewed at a glance, displaying the repeater elements on multiple maps simultaneously. In a logical tree view, relationships between network elements - base stations and repeaters - are displayed using a hierarchal build-up. Numerous alarm sources indicate where faults have occurred in a particular repeater, which substantially simplifies maintenance as well as decreases outage time. By continuously monitoring the network utilization, the operator can optimize network growth. "The solution allows us to determine how much network traffic is being handled by a particular repeater during any given period. Operators can easily decide where in the network extra capacity is required," comments Håkan Samuelsson. High signal quality generates a reliable and optimized network, thus increasing revenue for the operator and minimizing churn. The signal quality is measured by a number of parameters such as noise figure and correct gain setting. The latter is achieved through Automatic Level Control (ALC). The noise figure in Avitec’s repeaters for GSM or EDGE is extremely low, which means a minimum degradation of the base station’s sensitivity and therefore the base station’s coverage area can be optimized. Too strong signals from neighboring cells can lead to reduced signal quality transmitted by the operator’s own base station. An Input Overload Alarm detects input signal levels from neighboring cells. If the signal level is too high, an alarm will be sent to the OMC, thus making sure that the signals transmitted by its own base stations remain high. An interesting tool found in Avitec’s repeaters is the Frequency Scanner that can detect the value of the signal level from a specific neighboring frequency. The goal is to minimize interferences in the network. The information obtained by the Frequency Scanner is of great use when selecting an appropriate site and placement of antenna. Also, in the actual commissioning procedure, correct repeater gain can more easily be set. One seamless 3G network can easily and to a minimized cost be deployed through the use to Avitec’s most recent launched repeater solutions, for coverage in both rural regions and indoor environments. The concept of the Frequency Translating technology offers WCDMA/EDGE operators very interesting cost-saving opportunities in rural areas. By operating on two different frequencies, there is little or no need for any isolation. As a result, site acquisition is much easier, shorter masts can be deployed and thereby the capital expenditures are considerably reduced. Higher data rates indoors create an opportunity for increased revenue, which is achieved through installing a flexible fiber optic antenna system called FiberDAS.